The unseasonably warm December weather in the eastern US seems to be drawing to a close- giving way to more normal, colder temperatures. In the southeast, some thought it an appropriate time to start building the ark… as the rain just would not stop. 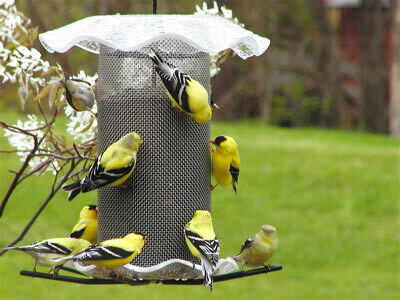 Take all that rain combined with extreme warm temperatures and think about your bird feeders for a moment. Yuck! Plain & simple… a four-letter word for a nasty, damp, moldy mess 🙁 With consistent rains, it doesn’t even matter if you’ve just cleaned the feeder well, or scraped the mold off suet because the nasties come right back. Oh, and the smell? If you can smell the seed, chances are about 99.99% the seed is spoiled. Although birds have no sense of smell, they do have the smarts (for the most part) to stay away from spoiled seed. But here’s the kicker: with temperatures dropping to freezing and snow already falling in many parts… flocks of finches and pine siskins may appear at nyjer feeders overnight. 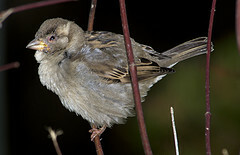 Famished, freezing and in dire need of energy (calories) to sustain themselves overnight, many of these finch-like birds may partake in whatever is being offered. 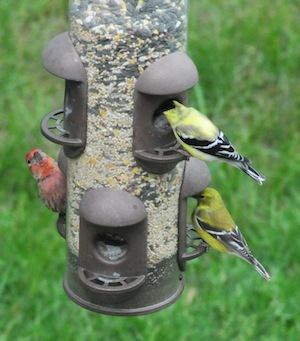 If your feeder happens to be serving moldy seed, it’s a recipe for disaster among these local flocks. 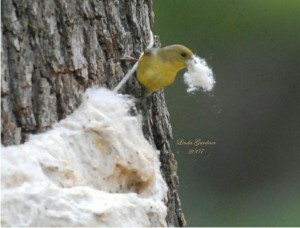 Even if you can’t see the green, white or gray stuff, birds ingest and pass these mold spores which are usually fatal. Generally referred to as respiratory disease or salmonella, the bacteria may have several names, but all pretty much cause a slow and painful death and or blindness resulting in starvation and predation. Sick birds appear lethargic, allowing you to get too close for comfort. They cling to feeders (whether food is fresh or old) and their eyes may be swollen, or even shut. Their bodies are puffed up, but it’s a different stance than when healthy birds are just trying to keep warm. Affected birds may rock, or even shake depending on the severity and stage of disease. At this point it’s the feeders themselves spreading the disease, not just the sick bird, and that’s where the tragedy lies. Feeders must be taken down, bleached and not returned for use for at least two weeks or until the flocks disperse. The ground below feeders must also be cleaned up, even moving a hanging feeder or placing a feeding station on clean ground is a good idea. It’s an awful lot of work, and your heart starts breaking when there’s snow and birds are calling for their food. But the alternative is far worse, with one dead bird, a few dead birds, and eventually a whole bunch of fatalities around the landscape. In our yard now it’s almost impossible to clean the ground below feeders as there are virtually puddles and mush everywhere. Since we’ve been through this ordeal once already, it looks like New Year’s Eve (day) will be spent cleaning feeders and probably moving them around the yard. First we’ll check the weather, and should the forecast call for more rain… maybe we’ll start the ark instead! But in all seriousness, please keep bird feeders and feeding areas clean. Because we attract these birds in an unnatural setting, it is solely our responsibility to promote healthy feeding areas. And a Happy & Healthy 2016 to you and yours! Thistle Feeders are in High Gear Once Again! It may be officially summer, but the tail end of spring nesting season is still going strong. Goldfinches are just starting to nest now, which means you’ll be seeing a whole lot of yellow at thistle feeders in the next 2-3 months. Goldfinches don’t use birdhouses, so there’s no luring them in with that. They’ll raise their broods in mature hedges or trees, constructing nests of woven plant fibers and down. 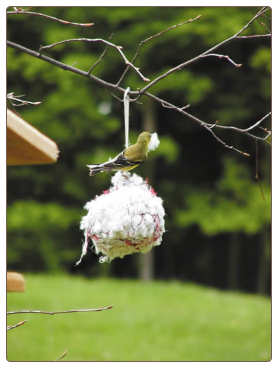 You can encourage them with some nesting materials placed in the vicinity of thistle feeders. 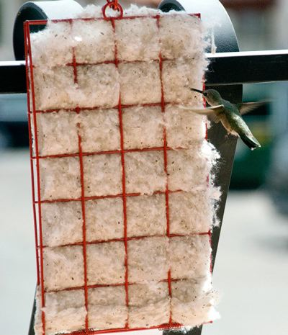 They’re partial to Hummer Helper, the hummingbird nesting material, feathers and other fibrous nest offerings. Unlike some more aggressive birds, goldfinches are quite demure, they’d rather fly off than fight for a spot at the feeder. 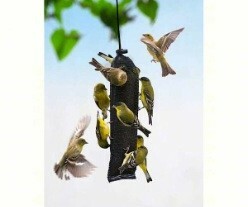 This where lots of perches, or an all-over feeding space to accommodate them are ideal. 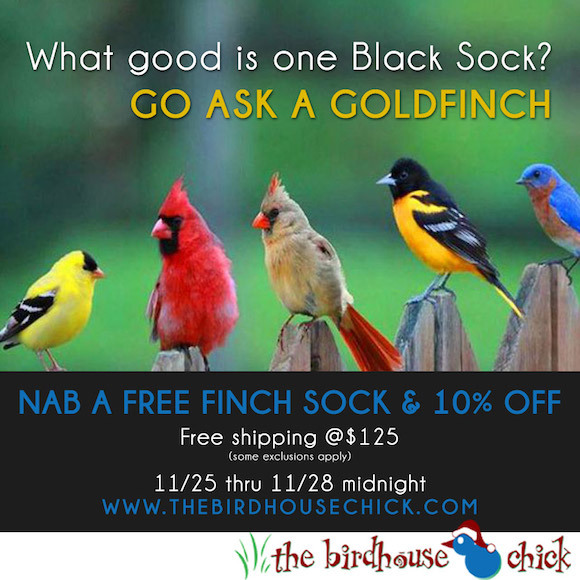 Thistle socks are another great choice for goldfinches’ busy time of year. You can easily offer several different feeding spots, without spending a whole lot! Parents will feed babies thistle seed almost exclusively at first, sometimes mixed with finely chopped sunflower bits, you’ll see finches consuming this seed mix too. As always, fresh water is critical to any bird’s environment. Keeping your bird bath clean is important stuff, for them and for your yard – especially in warm summer weather. 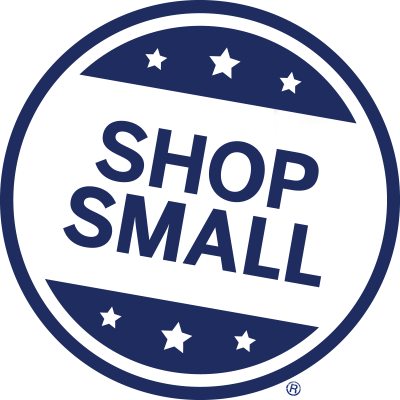 Keep water shallow (no more than two inches) and keep it fresh… and they will come! 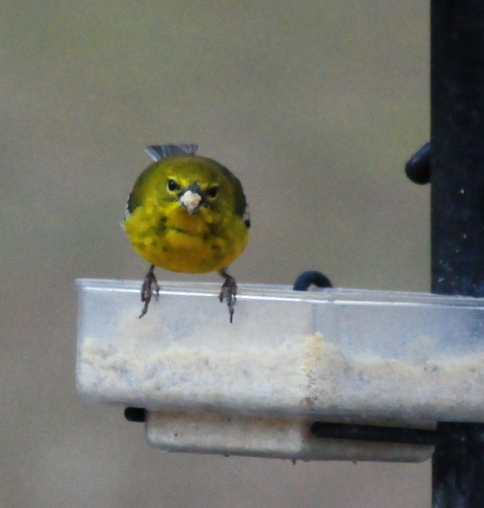 Oh wait, once goldfinches molt again in September they’ll turn an olive-drab color… but don’t quit feeding them. If you offer thistle year-round, their electric yellow plumage will grace your yard every summer! not another nyjer feeder post? Well yes actually! 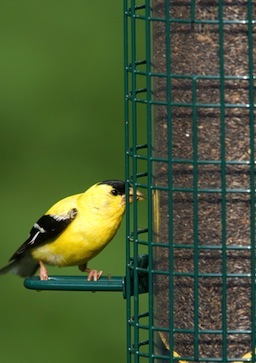 Because goldfinches are the birds with the latest nesting season, and because we saw this cool post over at 10,000 Birds, something on nyjer feeders seemed appropriate. One of the sweetest little resident songbirds, they’ll stick around your place if a consistent food and water source is provided. Although they may not be as pretty in winter, their song remains the same. The article we found interesting was on the Winter Finch Forecast and conveyed some great info on the why, when and where of several species of finches. Did you know crossbills and grosbeaks were part of the finch family? We didn’t! 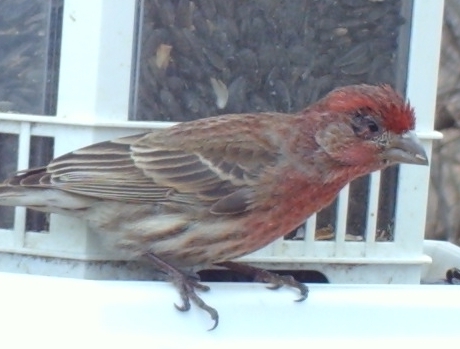 don’t dead-head those finch feeders! The only good thing about standing at the sink is catching the bird action on the deck! At present there’s five hummingbird feeders, two bird baths, and an open tray feeder… which squirrels usually hog. And flowers-gotta have plants and color to complete the scenery. In fall, spent flowers like zinnia, coneflower, sunflower… and lots of others with seed heads provide a bounty of food for wild birds. They’re actually nature’s finch feeders. So next time you have the urge to dead-head those spent blooms… don’t! Leave them a while longer so they can do what nature intended… feed the birds. I never did get close enough for the intended photo… but at least a better shot sans the fee t! Goldfinches happen to be one of the latest nesters, we have always conveyed this, but never with the logic behind why this is so. The following appeared on ListServe and answers the question to a T. Pretty interesting stuff! I don’t know much about them, but I have heard that they wait to nest until dandelion thistle is available. Any truth to this? 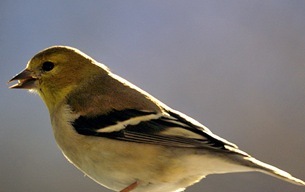 “American Goldfinches are really interesting birds. I don’t think it’s understood scientifically, but they do time their nesting very closely to the flowering of the entire true thistle family, although they eat a wide variety of small seeds. (They aren’t dependent on dandelion seeds, since dandelions go to seed all season long.) They are almost completely dependent on a seed diet, even feeding their nestlings a seed slurry from their crops (unlike most songbirds–even the seed-eaters–which feed insects to their kids). In part, it is believed that they can feed seeds to growing nestlings because thistle seeds, easily plucked from a nyjer feeder, are so high in protein, compared to other seeds. We used to have a real struggle raising orphaned goldfinches in rehab until we understood the importance of the high protein content of the thistle seeds with which the babies grow up. We used to feed them a seed-based formula, since that’s what the adults do, and they typically failed to thrive. However, once we switched to the insectivorous formula (which doesn’t contain insects per se but has more protein than the seed-based formula does), many of the problems resolved. 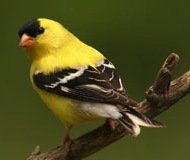 This interrelationship with the thistle family makes American Goldfinches pretty much the latest avian breeder in North America, since thistles bloom very late in the season (late July and early August here). At the wildlife rehab center, you know the breeding season is coming to a close when you start to hear those incessant, piercing baby contact call notes ringing through the center halls, boring a hole into your so-totally-done-with-baby-bird-season brain. Music to my ears personally. “We are just learning about the appetites of the finches. Recently some folks in Alexandria, LA developed an interest in backyard birding. 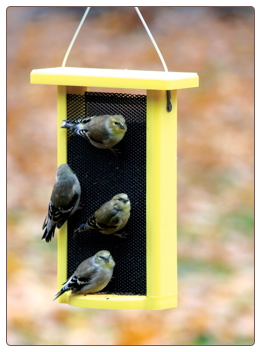 Diving right in with a suet feeder, hopper style feeder for sunflower seed, a bird bath with mister (for summer) and two thistle feeders, the timing couldn’t have been better – for the birds and for them to witness the amazing flurry of activity this pre-spring season. By her note above, we’re gathering they’ve got flocks of pine siskins and goldfinches in the yard right now, we sure do here in North GA.! For months thistle feeders sat, with seed going bad due to lack of activity. Then out of nowhere… tons of birds chowing down on thistle! Also called Nyjer, thistle’s other nickname among many is “black gold” because it’s not a cheap seed to offer. A bit on the pricey side, it does have the benefit of being a non-germinating seed, one of very few seeds that won’t sprout weeds. But it’s about the only food adults will feed chicks in summer, so extra feeders (like thistle socks) and lots of seed greatly helps goldfinches thrive and flourish during their late breeding season (June and July). 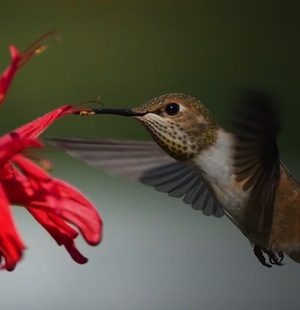 Being new to the birding scene, Jan had the right idea in mind when she inquired about creating a welcoming and bird-friendly habitat in their yard. 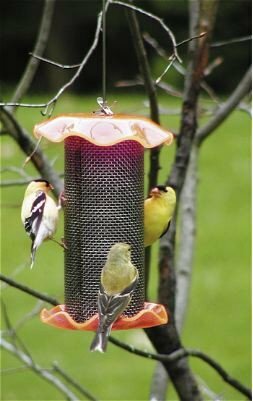 No single feeder, house, or birdbath will attract as many song birds as an overall habitat with natural food sources and shelter. And since we’re in the same planting zone, it was fairly easy to come up with a few suggestions too. Rather than re-word, and re-type the email, here’s our thoughts on cre ating an attractive and wildlife-friendly environment. Overall: Mature trees and Shrubs are very good for attracting all winged friends as not only a food source, but shelter. Since this is an open area, I’m thinking your yard must have mature trees along the back/sides? Many birds nest in trees and shrubs as they’re not all considered “cavity-dwellers” (birdhouse users). If you’d like some kind of height or focal point around the new area, Butterfly Bush, Viburnum, Mimosa, or a Crab Apple is a great choice. These are hearty, and provide both shelter and food (nectar or fruit). Any of the native berry-producing shrubs will also provide a great food source. Using pots for annuals is always a great option too, for color, nectar and seeds in fall! Petunias, Zinnias, and various salvias; most garden center plants now have tags depicting if the plants provide a food source, so just look around. There should be lots of options here! You can even save seeds in the fall for replanting in spring. Cardinals, chick adees, finches and titmice will eat seeds of many plants. The trick is not to dead-head them in fall when the urge strikes! 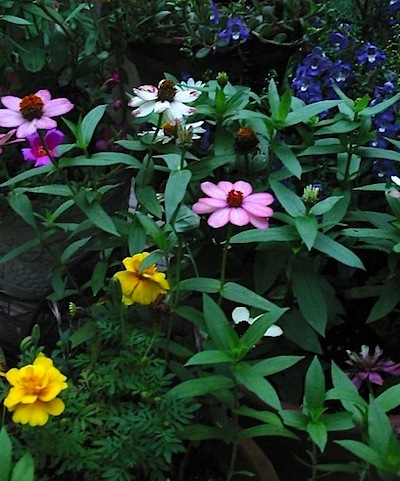 There are lots of perennials that fit the bill in this category: coneflower, coreopsis, seedum, black-eyed susan, goldenrod, sunflowers, mexican sunflower, native salvia-(very good), coral bells,. Again look around at the garden center, and if you’re lucky… you’ll find an employee with some knowledge on the subject! As far as for ground cover: I think mulching the area and adding plants is a better option than a solid ground cover. 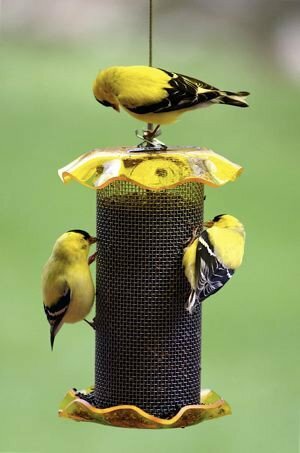 You’ll want to be able to get to the feeders, bath, mister and “parts” of the landscape without stepping all over things. Also, spilled seed may sprout weeds, and it’s easier to control that if not covered solid with growth. Day lilies are a good choice, the Stella de Oro’s are quite hearty and pretty! 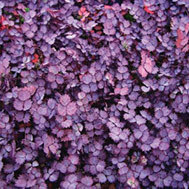 If you wanted something more low-growing that spreads, (full sun) try purple sheep’s burr, also called purple goose leaf. In fact this would be a beautiful contrast with yellow lilies! The Stella variety tends to stay more compact as opposed to some which grow taller and appear “lanky”. Never, ever plant creeping strawberry, or ivy…these are the bane of my existence in parts of my yard 🙁 They are also a wonderful habitat for snakes, especially if you’ll have the mister going when it’s warm! Native salvia: I’ve got a bed of this which provides color from spring through fall. Vibrant red, there are always hummingbirds and butterflies hovering. It’s actually below one of the misters, and does well with the “extra water”. Extremely hearty, it multiplies each year, spreading roots, but does tend to grow taller, more of a back-drop. Lantana would also be a good choice if you’ve got the space for it to grow. 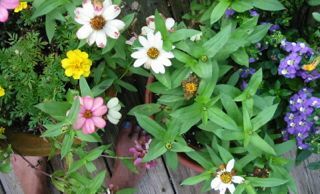 I love perennials! It may be helpful to actually sketch out the area on paper before planting. Drop in the plant names to get an idea. 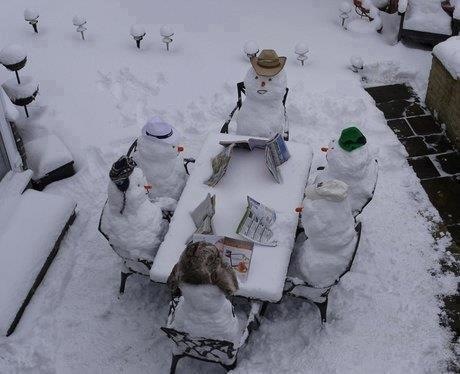 You can always do search for pics to get an idea too!